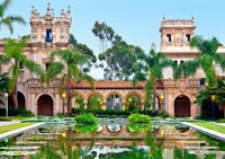 Named after Spanish explorer Vasco Núñez de Balboa in honor of the 1915 Panama-California Exposition, Balboa Park is home to a unique range of attractions from its historic carousel and quaint international cottages, to its artist colony and the world-famous San Diego Zoo. Where culture, science, and nature collide, Balboa Park is home to more than 16 museums, multiple performing arts venues, lovely gardens, trails, and many other creative and recreational attractions, including the Park’s California Tower which offers panoramic views of San Diego. With a variety of culture institutions among its 1,200 beautiful and lushly planted acres, there is something for everyone. Enjoy the richness of San Diego’s early history as California’s first settlement. Take the time to explore the many historic sites and shop in a variety of stores that can only be found in Old Town. Old Town sidewalks overflow with people who come to revisit history, to shop and to savor some of the best and greatest variety of food that San Diego has to offer. While regional and Mexican specialties are not to be missed and present many cooking styles, visitors to Old Town have a wide choice of cuisines. The area has a history rich in diversity so you can also find early California fare along with Italian, Japanese, Creole, Peruvian, and great seafood. 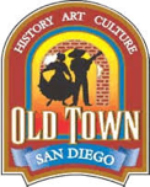 For additional information, check out the Old Town San Diego Guide. Located in Balboa Park is the San Diego Zoo, one of the most famous zoos in the world. The zoo is home to more than 3,500 rare and endangered animals representing more than 650 species and subspecies. Its botanical collection includes more than 700,000 exotic plants. 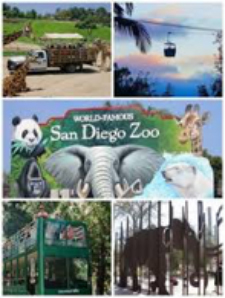 The San Diego Zoo was a pioneer in the concept of open-air, cageless exhibits that re-create natural animal habitats and is a world leader in species conservation. Founded in 1916, the Zoo has been an icon in San Diego for over 100 years. Only at SeaWorld can you get close to dolphins, penguins, sharks and more. See awe-inspiring shows with magnificent killer whales, playful dolphins, humorous sea lions plus an amazing pet show featuring adopted animals. Dive under the sea at Explorer's Reef and touch a crab, shark, or playful cleaner fish. Experience exhilarating rides, roller coasters and water rides. Experience this beautiful park located on scenic Mission Bay. San Diego’s Water Wonderland, a 4,600-acre aquatic park dedicated to leisure and active sports, it is the largest water park of its kind in the world. 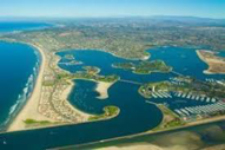 Mission Bay Aquatic Park beckons water sports enthusiasts to this fantastic water nirvana. From kayaking and stand up paddle boarding to water skiing, sailing, kite surfing and everything in between, Mission Bay is a water playground without compare, and on land, visitors can bike ride, picnic, barbecue or enjoy a bonfire right next to the water. Not only is this area the epicenter of San Diego’s nightlife scene, it is also rich with cultural offerings that include theatres, art galleries, symphony halls, concert venues and museums tucked tightly into 16 ½ blocks. Coronado Island draws a lot of tourists, and you may be wondering why. It's home to a Naval Air Station and the U. S. Navy SEALS center, but it's not the military that attracts tourists. It's not Frank Baum's Oz House, Wallis Simpson's home or the Coronado Island Museum, either. It's not even the famous Hotel del Coronado. Most people go to Coronado for the white, sandy beaches that have earned it numerous ratings as one of top ten beaches in the USA. Visitors also like Coronado Island for its quiet, laid-back simplicity and for its beautiful views of the downtown San Diego skyline. 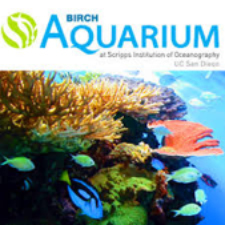 Perched on a bluff overlooking the Pacific Ocean, Birch Aquarium features more than 60 habitats of fishes and invertebrates from the cold waters of the Pacific Northwest to the tropical waters of the south. An oceanographic museum showcases research discoveries by Scripps Oceanography scientists on climate, earth, and ocean science and includes interactive elements. Discover La Jolla, San Diego’s jewel by the sea. La Jolla is a smart seaside area, known for its rugged coastline. Trails wind past pine trees and sandstone canyons in Torrey Pines State Natural Reserve, while the two courses at world-renowned Torrey Pines Golf Course sit atop sea cliffs. La Jolla Cove has sweeping ocean views, and the Shell Beach tide pools are home to anemones and crabs. Posh boutiques and waterfront restaurants dot walkable La Jolla Village. The Museum of Contemporary Art San Diego, the family-friendly Birch Aquarium and the acclaimed La Jolla Playhouse deliver breaks from the sun. Carlsbad is known as "The Village by the Sea" with its seven miles of fine white sandy beaches, great restaurants, shopping, golf and more. This small, affluent community about half way between San Diego and Los Angeles has the charm of an old European city and the atmosphere of a typical Californian coastal resort community. Carlsbad attractions include Legoland California, Sea Life Aquarium based out of Legoland and South Carlsbad State Beach, Batiquitos Lagoon, the Flower Fields at Carlsbad Ranch. Wine Enthusiast, in its February 2019 issue, proclaimed Temecula Valley as one of the "10 Best Wine Getaways." Travel inland to the wine country to tour beautiful vineyards and sample California wines. There is an app to download to do your own tour of more than 30 wineries. Other activities to enjoy include cultural attractions, golf courses, Old Town Temecula, hot-air adventures, hiking and wildlife watching in the Santa Rosa Plateau Ecological Reserve, bicycling and horseback tours through the many vineyards. Julian is a premier mountain getaway situated in the scenic Cuyamaca Mountains. This is a charming, small historic town dating back to the Gold Rush days of the 1870’s. Take a step back in time to the days of Julian’s beginning. See where gold was discovered. 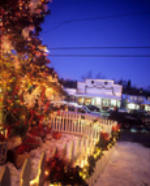 Shop stores housed in buildings dating back to the 1870’s, sample Julian’s famous apple pie, hike among the trees or ride down Main Street in a horse-drawn carriage. A day trip to a town grounded in history of Native American culture, San Juan Capistrano offers a lot of rich history and will introduce you to one of the most beautiful missions in California. The Mission San Juan Capistrano is over 200 years old and is a great place to visit. You can learn about the multi-cultural history of the town then spend time in the quaint downtown. Visit the Los Rios District, California’s oldest neighborhood, to see some of the original adobe homes that have been carefully preserved. Across the road, is the beautiful Capistrano Depot railway station. On top of Mount Palomar is the impressive and educational Mount Palomar Observatory, a center of astronomical research and home to the world’s largest working telescope, the 200-inch Hale Telescope. The Mount Palomar Observatory has been pioneering astronomical research for many, many years and is a must-visit for anyone curious about the stars in the sky. Disneyland Park and Disney California Adventure are among the most popular destinations from San Diego. The Disney Parks are both packed with attractions and activities for all ages. The easiest way to travel is by car. Click here for car rental information. Amtrak train service runs between San Diego and Anaheim. Their Pacific Surfliner route runs between Old Town or downtown San Diego and the Anaheim Regional Transportation Center, about two miles from Disneyland Park. From the Anaheim Regional Transportation Center, you can take a bus or taxi to Disneyland Park. Greyhound bus lines run from downtown San Diego near the baseball park to the Anaheim Regional Transportation Center with stops along the way. Tefusa bus line runs between San Diego and Anaheim that stops near the Disneyland Park entrance without the need to transfer to another bus to reach your destination. Welcome to California’s liveliest city, entertainment capital of America, with megastar wattage and nonstop activities. See a movie star. Sip a cocktail on a rooftop bar at sunset. Slip on a pair of designer shoes in an ultra-luxurious boutique in Beverly Hills. Play at Universal Studios Hollywood theme park, explore world-class museums, or dance the night away in a starlet-filled club. From movie star house sighting tours to people watching at Venice Beach, walk the iconic Santa Monica Pier, Hollywood and the Walk of Fame, Beverly Hills, Universal Studios, Griffith Observatory, J. Paul Getty Museum, and the California Science Center, these are just a few places to explore. 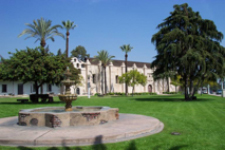 Northeast of Los Angeles is Pasadena, one of the primary cultural centers of the San Gabriel Valley offering a great selection of cultural, historical, and outdoor activities. Pasadena is home to many scientific institutions including Caltech and the Jet Propulsion Laboratory and is known for hosting the annual Rose Bowl football game and Tournament of Roses Parade. Art lovers have a lot to choose between such as the Norton Simon Art Museum, The Armory Center for the Arts, and USC Pacific Asia Museum. Outdoor enthusiasts can hike Eaton Canyon, or tour the beautiful Descanso Botanical Gardens. History buffs will enjoy the Historic San Gabriel Mission District.